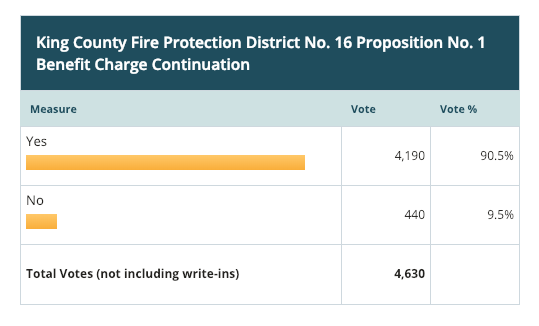 Even though these are the first reported results for the Northshore Fire issue on the special election ballot, it's safe to say that we will not need to follow the results closely. First reported results show that 90.5% of the 4,630 ballots cast were affirmative. The measure is a continuation of taxes already being paid by citizens of Lake Forest Park and Kenmore to support fire services in the two cities. Northshore Fire has two stations, with the main headquarters in Kenmore, and a station in Lake Forest Park. The legal name of the district is "King County Fire Protection District No. 16" but is known as Northshore Fire. Was this for Shoreline residents? How come we never received a ballot in the mail? This was for Kenmore and Lake Forest Park. Shoreline did not have any measures on the ballot.